It’s hard to believe that an underground metal band that’s been around for 15 years with 6 albums is just now releasing its first vinyl offering. We say better late than never. But they’re super limited and flying off the shelves (well, not literally that would be some exorcist s#@t). We presse 100 to test the waters and couldn’t believe how fast they sold. If there any left they’ll be here at icaruswitch.com on our shop. Click the pic to see. What makes Pittsburgh one of the world’s most metal towns? Icarus Witch founder Jason Myers takes Decibel Magazine’s readers on a behind-the-scenes look at the Iron City. What makes Pittsburgh one of the world’s most metal towns? Icarus Witch founder Jason Myers takes Decibel Magazine’s readers on a behind-the-scenes tour of the Iron City. Bass Player Magazine featured Icarus Witch bassist Jason Myers in this candid playthrough video of the isolated basslines for the song, Goodbye Cruel World. Click the pic to check out the video at BassPlayer.com. Click the image below to get your tickets now! 1st (& currently only) Icarus Witch show of 2018. Click HERE for tickets. Space is limited so don't miss out on your chance to celebrate Halloween with The Witch! BREAKING: Decibel Magazine debuts brand new Icarus Witch single "Misfortune Teller" as well as pre-order link to the new album! Click the image below for the full release. Fifteen years and five albums into their career Pittsburgh-based traditional heavy metal band Icarus Witch found themselves seeking a new voice for their first album since 2012’s RISE. They found the ideal vocalist in Andrew D’Cagna, a name many will recognize from his work with artists like the doomy Brimstone Coven or Ironflame, his solo project that took many metal fans (and critics’ best-of-2017 lists) by surprise. As reported last year, the drum sessions were performed by Jon Rice (Skeletonwitch, Job For A Cowboy, Scorpion Child…) but what has not been announced until now is that the mixing duties and pre-production for the new music is being handled by Grammy award-winning producer Neil Kernon (Queensryche, Nevermore, Dokken, Judas Priest). D’Cagna produced his own vocals at Sacred Sound Recording, a busy studio that he operates when not on the road or running Hot Rod Tattooing & Body Piercing shop, both of which are in Martins Ferry, Ohio. The guitar, bass and drums were tracked by one of Pittsburgh’s most in-demand up-and-coming engineers Shane Mayer (Deathwhite, Post Mortal Possession) at Cerebral Audio where he also edited the video that he filmed for the “Goodbye Cruel World” single. When it came time to choose a mastering facility, former Icarus Witch producer/guitarist Dave Watson recommended Fascination Street in Stockholm, Sweden as they did an admirable job polishing his last production for Argus. This proved to be an excellent match for the new Witch, which was consequently mastered by Jens Bogren whose showreel includes the most recent Amorphis and Katatonia. The full-length album, Goodbye Cruel World, will be released later this year through Cleopatra Records but in the meantime the band wanted to share this title track single as a thank you to the fans who’ve waited patiently for new music. Our friends from Brave New World (the sadly now defunct record store in Oakland where Icarus Witch played their first ever show) unearthed vintage out-of-print IW merch so we're having a giveaway. • Comment below with your favorite Icarus Witch song and why you dig it. • Then message us at icaruswitch.com/contact with #ThrowbackWitchPack in the subject line. One unlucky winner will be drawn from a hat on Facebook live this Monday, March 5th at 8PM EST! * Contest is open to metal heads world wide. Shipping is free and sizes are limited to what is on hand. Good luck and see you Monday on Facebook.com/IcarusWitch! 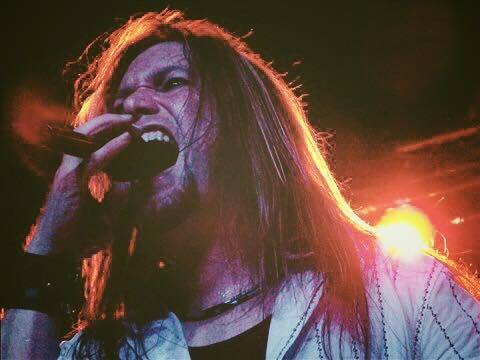 We'd like to take this opportunity to thank Christopher Shaner for seven killer years as the lead vocalist for Icarus Witch. Chris joined the band in 2010 and was immediately swept into our cycle of tours and madness. We paused a couple years later just long enough to track the Rise album before heading back on the road. Shaner delivered the goods consistently with his distinctive powerful vocal style and charismatic showmanship. The band took a hiatus in 2016 and returned to the stage in early 2017 with plans to write the 6th album and fire up the Witch machine once again. Christopher decided that it was time to focus on other endeavors and move on from the band. We were disappointed because we were looking forward to writing and recording with him again, but respected his decision and have always held a "Stay if you will, go if you must" policy with band members in good standing. We sincerely wish Chris all the best in his future endeavors and will be making an announcement in the coming weeks regarding the new vocalist for Icarus Witch. We've got an announcement to make regarding the title of (and inspiration for) the new Icarus Witch album. But rather than just blog about it here, we'd like you to check out this short interview over at BraveWords.com! ANNOUNCEMENT: Due to scheduling issues Dave won't be playing the Amorphis concert with us on March 19. It's going to be a busy year for all parties involved so we can't say with certainty what capacity he will play in the upcoming album or shows to follow, but we're leaving the door open for the future. We're all on the best of terms and wish our brother much success as well as sincere gratitude for the unparalleled role he's played in the past 7 years of Icarus Witch. While we've stayed in touch with many of you via our social media pages (linked on this site) it's been a while since we updated the news section here at IcarusWitch.com. While we decided to take a short hiatus last year after a decade plus push of writing recording and touring -- we're getting back into action with new tales to tell and a fresh perspective in 2017! We're super stoked about the way the new music is flowing and think you will be too. 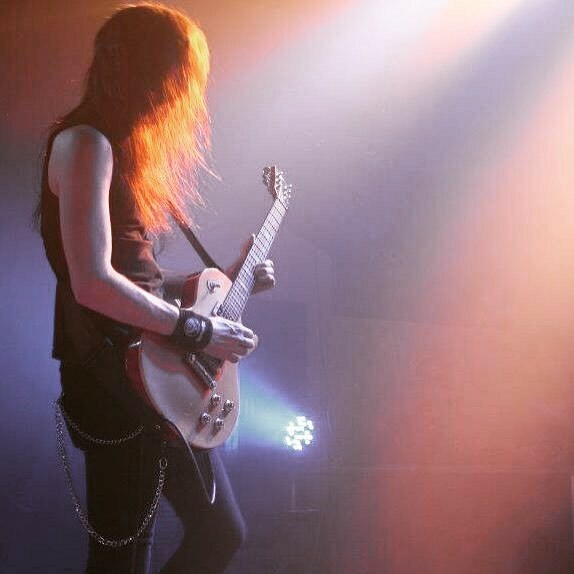 Rather than book a bunch of shows and play the same old set, we're holding off on touring until we can add some exciting new melodic metal into the mix with the classic Witch you've come to expect. Thanks for your patience and all the love and support you feed us with on Facebook, Twitter, Instagram, and YouTube each day! Been a long time since we Rÿche & Rolled! 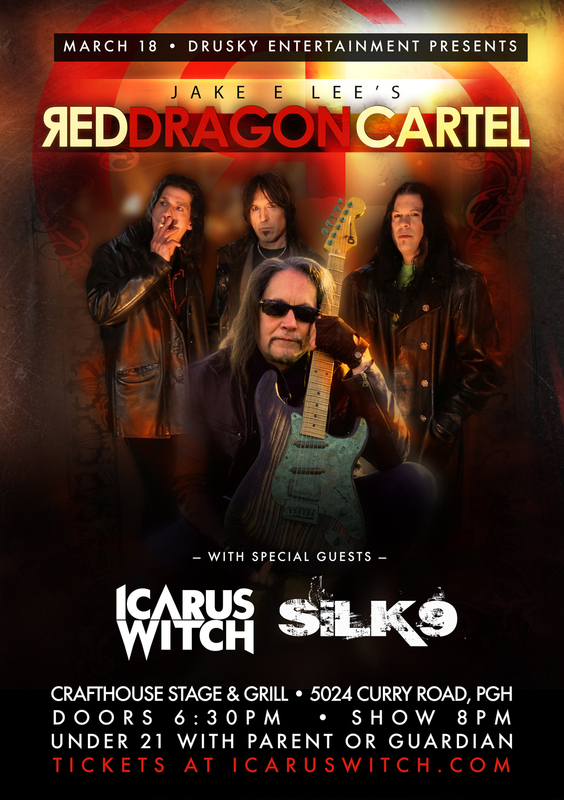 Icarus Witch will be opening for Queensrÿche in Pittsburgh! Get your tickets now at our shop! What's up in Witchland? Check out the latest Q&A with infamous rock journalist Natalie Perez by clicking this link. We're kicking off 2014 in style. This is the first ever unveiling of the completely redesigned official home of Icarus Witch on the web, IcarusWitch.com! To celebrate a new year and discuss what's in the works for the Witch brigade, we're joining Doc Rock live on the air for Metal Shop 101 on Z ROCK 106.9 KKZR. Listen online HERE.